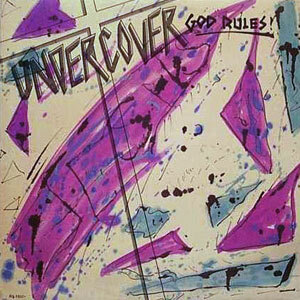 Undercover's 1983 album, God Rules! I started my own musical discovery in the mid-90s after being raised on Bill Gaither, John Denver and some oldies. When my mom said I couldn’t play the Steven Curtis Chapman tape I bought at a garage sale for a quarter in the family room stereo, I rebelled and found even harder music to listen to. I absorbed Keith Green and Steve Taylor records. (They were still christian, so I felt I could defend myself if my mom complained.) Then, with help from my friends’ older siblings, I discovered Fugazi and Dinosaur Jr. It was at about that same time that I discovered christian bands who sounded really cool, too. Not those they’re-alright-for-a-christian-band types, but bands just as good and thoughtful as anyone else out there. I joined message boards and discussion lists for these bands, totally geeking on that entire scene. What’s crazy is that I’ve been following almost all of their projects since. Even after dumping all my bad christian music and buying tons of far-out secular music, I still prize almost anything that Gene Eugene, Steve Hindalong, and Terry Taylor have ever touched. I swear that Adam Again’s Dig is as good as any Led Zeppelin record, historical importance aside. I found community and assurance in what became known as the chrindie (christian + indie, and no, I didn’t make that up) scene. My friend, Dan, and I felt the freedom to make and record music in his basement that sounded like whatever we wanted. That whole community piece of the chrindie scenes has eroded, for several reasons, and one of the biggest online meeting places, The Vagrant Cafe, has now closed. Because few have a sense of history and fewer still know where to find these obscure bands and their fans, the movement is all but forgotten. So when people (including some Christians) tell me they don’t know what good came out of alternative christian music, I kinda scratch my head. I don’t want to flippantly remark that they don’t get it, but they don’t, and probably never will. Anyway, here’s this week’s show*. Enjoy! *Episode 26 is a little more dynamic than usual. I hope that’s alright.